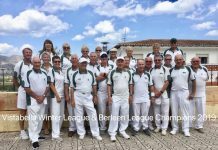 In the Voyager Division theSputniks entertained league leaders Vistabella Buggies and found the going tough winning on the rink of Dot Kocsis, Ann Edgerton and Ken Stringfellow by 21-17 picking up 2 points in a loss by 1209 shots to 60. The Pioneers visited Greenlands Chestnuts losing by a narrow 80 shots to 78 picking up 4 points. Winners for the Pioneers were Irene Laverick with Tony and Val Dalton 16-12 and Barbara Cooper, Alan Mawer and Dave Laverick winning 17-16. In the Winter League for La Siesta played Quesada and won on 2 rinks picking up 4 points losing the overall shots by 89-79.Winners for La Siesta were Barbara Cooper, Val Dalton with Mike and Florence Edwards 22-9 and Rab Logan, Jim Eastwood, Jim Hudson and Alan Mawer 18-12dwards winning 20-14. 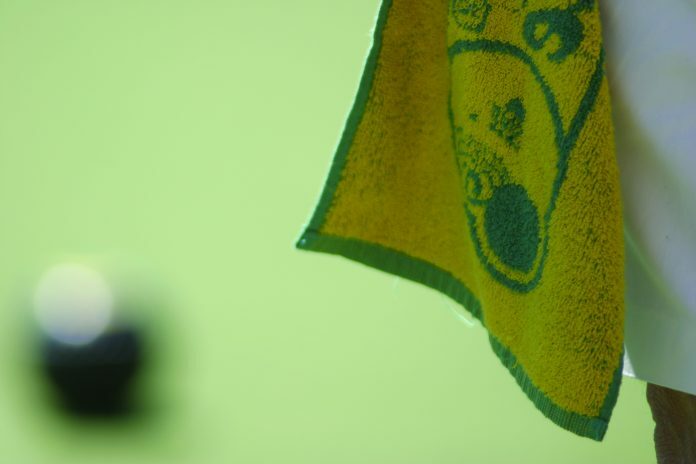 In the Fed 4’s the Parakeets travelled to Emerald Isle Leprechauns and lost by 69 shots to 38 losing by 8 points to nil. 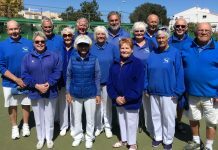 In Division A the Blues at Vistabella Picadors lost the match by 99 shots to 76 picking up 4 points from wins by Dave Davies, Brian Gardiner and Irene Mangan 29-17 and by Dawn and John Taylor with Jean Cooper 16-14. In Division B the Golds at Horadada Royals had a difficult day picking up just 1 point from a 17-17 draw on the rink of Derek Smith, Norman Adcroft and Alan Mawer. The overall shots went to the Royals by 91 shots to 68. In Division C the Silvers travelled to the league leaders Greenland Cedars and despite the team trying its hardest lost the overall match by 128 shots to 56. Well done on the rink of Wendy Ralph, Sheila Millward and Jim Eastwood beating their opposition by 23 shots to 15 picking up 2 p;oints for the Silvers. All our teams are working hard to claim more points but sometimes things don’t work out as hoped. SA League Monday 25th Klingons away v Q Pearls, close result; 6pts-6, 90shots-93. Winners: William Holtham, Sabrina & Russell Marks 23-15, Kath Reid, Colin Jackson, Ian Kenyon 19-14, Bob White, Ann Holland, Ray Pollock 26-12. Trekkers away v Q Diamonds, another close result 7pts-5, shots 90-85. Winners: Pat & Graham Bird, Peter Fuller 17-17. Ros Holmes, Marina Beardsall, Brian Pocock 18-15, Allen Bowen, Jan Pocock, Suzi Cooper 26-16. Romulans home v ER Palaminos, 2pts-10, 76shots-80. Pauline Johnson, Allan Lever, Ralph Jones 23-14. 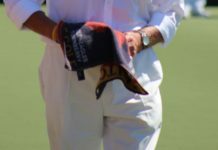 Wednesday 27th Winter League: after a slow start, a clean sweep home v La Marina. 12pts-0, 128shots-51. Pam Lockett, June Jones, Peter McEneany, Keith Jones 15-13, Kath Reid, Giuseppe Galelli, Neil Morrison, Ian Kenyon 30-10, Jan Pocock, Drew Russell, Sabrina & Russ Marks 32-9, Shirley Verity, Ray Pollock, Jo & Jules Pering 26-8, Ray Clarke, Keith Phillips, Bill Webb, Scott Malden 25-11. Southern League: Friday 1st Lions home v LM Ospreys, a good result, shots 90-79, 8pts-4. Winners: Bob White, Ann Holland, Ray Pollock 20-15, Colin Jackson, June Jones, Keith Jones 13-10, Margaret Morrison, Keith Phillips, Neil Morrison 25-13. Tigers, a shock result away v GL Oaks, 78shots-97, 0pts-12. Leopards away v Q Swans, a good result: 8pts-4, 94shots-70. Winners: Ray Watmough, Dave Tilley, Drew Russell 24-4, Dennis Jackson, Steve Rossiter, Bob Bromley 27-11, Chris Jackson, Ian Ross, Brenda Brown 18-14. Pumas, home v VB Conquistadors, had a close game: 6-6, 83shots-88. Winners: Pauline Johnson, Allan Lever, Ralph Jones 19-17, Chris Phillips, Robert Hicks, Lyndon Johnson 24-17, Pat Barnes, Roger Inwards, Tom Fromson 14-13. We are a competitive but friendly club; you’re welcome to join in “Vic’s hamper” on Saturday & some Tuesday mornings. 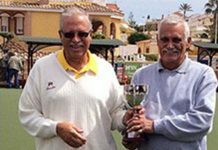 For more information & calendar, check SLBC website at: www.sanluisbowls.byethost7.com We welcome new & experienced bowlers, come along & see us, or for more help contact June Jones, Club Captain: 691 903 773. What a difference a week can make! Our bowlers were on better form this week with some good wins despite some very competitive matches. In the South Alicante Winter League, Quesada Pearls held off San Luis Klingons for a 6-6 draw narrowly winning the shots 93-90. This performance means the Pearls have maintained 4th place in the league. Meanwhile the Diamonds put up a great fight in a very close match against San Luis Trekkers. Some of the rinks won or lost by only 2 or 3 points for a final result of Trekkers 7 points, Diamonds 5 points and the shots were 90-85 to the Trekkers. Unfortunately the Rubies had a bad day against Greenlands Sycamore who won the match 12-0 and 94-71 shots. Results in the Southern League this week included a reversal of fortunes for Quesada Swallows against San Luis Leopards and they lost their match 8-4 points and 94-70 shots in favour of the Leopards. And a reversal of fortunes for the Swifts as well but in the Swifts favour! They were hosted by Montemar Toreadors and in a game of two halves initially in favour of the Toreadors, Swifts proved their tenacity and staying power coming back in the second half of the match to win it 12-0 points and 88-81 shots. In the Winter league, Quesada played away at La Siesta and enjoyed an 8-4 win with the shots 89-79, thus maintaining their 4th place in the league. Meantime, in the Federated 4’s, Quesada Panthers hosted San Miguel Mohawks and in a hard fought match, with several rinks decided on the last one or two ends, managed a draw, 4 points each. A good result for the Panthers and with only 2 games remaining, they’ve moved into 4th place in the league and will be working hard to maintain this – although the Mohawks and Condors are still hot on their heels. San Miguel Alsatians were away to Monte Mar Matadors, sharing the points 6 – 6, (85 shots to 80). The best winning triple were Ian Hope, Gerald Shatwell and Ron Nairey 25 – 13. San Miguel Beagles were home to La Marina Explorers also sharing the points 6 – 6, (69 shots to 66), the best winning triple were Noel Davis, Gail Willshire and Fred Willshire 18 – 9. San Miguel Dalmations were away to Monte Mar Torreadors, winning 10 – 2 (103 shots to 85). The best winning triple were Meg Brownlee, Mike Bayfield and Bill Brownlee 30 – 12. 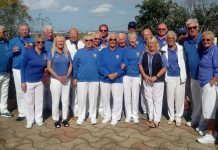 San Miguel Pointers were home to Country Bowls Flamingos taking all 12 points (116 shots to 67) The best winning triple were James Cutting, Brian Allen and Lynn Greenland 32 – 9. 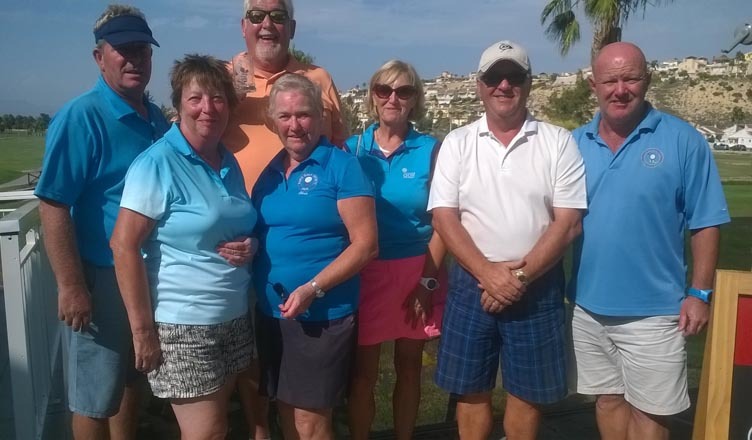 In the Fed 4’s San Miguel Mohawks were away to Quesada Panthers where they shared the points 4 -4 (41 shots to 45), the winning rink were Alan & Sheila Booth and Jan & Derek Farmer 18 – 11. San Miguel Cherokees were home to San Luis Conders winning 6 – 2 (58 shots to 46), the best winning rink were Brian Miller, Allan Patterson, Chris Collier and Steve Cantley 20 – 9. 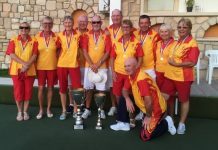 San Miguel Apaches were also at home and had a great win, taking all the points 8 – 0 (60 shots to 46) on the best winning rink were Anita Brown, Reg Cooper, Ron Nairey and Alan Campbell 19 – 13. On Friday San Miguel Boxers were home to El Rancho Broncos winning 10 – 2 (134 shots to 57), the best winning triple were Jack Jackson, Jim Jarvie and Brian Errington 36 – 6. San Miguel Bulldogs were away to El Rancho Mustangs losing 10 – 2 (96 shots to 78) the winning triple were Jan Farmer, Cliff Plaisted and Lynn Greenland 30 – 7. SAL ENTERPRISE League. 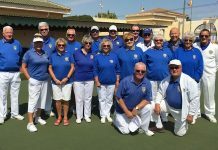 The Albatrosses entertained La Siesta Apollo’s this week, although there was some close games the Albatrosses only won on two rinks but they shared the points for the long game. Shots, VB 85(5) – 81(6) LS. The Drivers were away to the Emerald Isle Titans. Looking at the results I can see this was a very tight game, only one win on the day but great effort! Shots, 64(2) – 84(10)EI. DISCOVERY League. The Eagles playing the Emerald Isle Neptune’s and lost on all rinks, a disappointing result for the team but I’m sure everyone had a lovely afternoon bowling in this superb weather. Shots, VB 59(0) – 113(12) EI. VOYAGER League Buggies were at La Siesta playing the Sputniks, once they got to grips with this tricky green they went on to have a convincing win on all rinks bar one. Shots, 120(10) – 60(2) LS. WINTER League. A very early start for the long trek to Benitachell (BBC) but it was all well worth it as the team had a great win, four winning rinks and a good shot difference. VB 100(10) – 76(2) BBC. BERLEEN League also won their game 17-12.. They are doing so well! SOUTHERN League Lanzadores away to Quesada Swallows came away with a draw, three wins to the Lanzadores, two to the home team plus the shots. VB 76(6) – 83(6) Q.
Picadors were at home to Emerald Isle Claymores, they won on two rinks, lost on three. VB 76(4) – 84(8) EI. 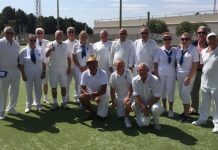 The Swingers at home to La Marina Merlins had four excellent wins and a drawn game, a very good and needed result to retain their excellent position in the league. VB 114(11) – 62(1) LM. The Conquistadores did very well playing the Pumas at San Luis, they won on two rinks with enough shots to win the long game, well done! VB 88(6) – 83(6) SL. The Flamingos travelled to San Miguel to face the Pointers on Monday, fielding an A division team in all but name, the Flamingos were put firmly in their place, losing on all rinks. Better luck next time and well done to the Pointers. 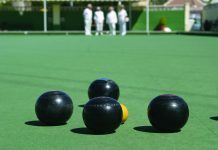 On Friday morning Country Bowls faced off at home against Greenland’s Elms in their second encounter this year. The Cubs were determined to hold on to their 5th place in the league. A fantastic mornings bowling with a 4 shot difference at the end, however, the Elms took 3 rinks to the Cubs 2. Overall score 8 – 4 to Greenland’s Elms. Winning rinks were; Chris Stevens, Dot Davies and Peter Robins, Sandra McIlroy, Dave Smith and Lynne Bryce. Well done to Greenland’s. 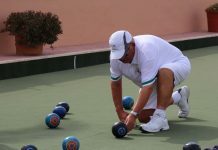 In the afternoon the Matadors from Monte Mar were next to visit Country Bowls. The Matadors came looking for revenge after a narrow defeat when they played the Geckos on their home green earlier in the season. However, the Geckos have been getting stronger by the week and attacked the Matadors like a herd of champion bulls!! No matter how much the Matadors swirled their capes and bowled their bowls, the charging Geckos ground them down. The attack was relentless and only one of the Matadors rinks struggled over the line, victors by just one shot. Against a strong team of Matadors that started the game three places above the Geckos in the league, the Geckos proved just how strong they have become by marching out victorious by 10 points to 2 and a shot difference of 103 – 69. Pat Patton, Derek Jiggins & Brian Patton fought ferociously and lost by only one shot after a terrific close game. Well done Geckos. In the Discovery Division, The Oaks were away to El Rancho Pintos. They are second, behind us in the league table so we needed a good result, all rinks were holding their own right to the finish so it was a tight last game to determine who had the shots. A very pleasant game was had by all and the final score was shots 89 – 95. Points 6 – 6. Best winning rink was S Cordell, R Cordell, skip D Webb. 27 – 12. Meanwhile at home the Sycamores were playing Quesada Rubies, final scores on the doors were, shots 94 – 71. Points – 12 – 0. Best winning rink was Z Wilcock, R Stansfield, skip T Hill. 23 – 11. In the Winter League, we were away to Monte Mar. A very pleasant sunny day and good company made it a very enjoyable game, Final score shots – 72 – 79. Points 5 – 7. Best winning rink was M Stephens, J Webb, A Eagle, skip D Webb. 18 – 13. In Div C Southern league, The Cedars were at home to La Siesta Silvers. Final score, Shots 128 – 56. Points, 10 – 2. Best winning rink. C Eagle, T Hodges, skip M Brown. 30 – 8. 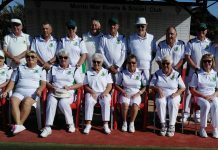 Also in Div C. the Elms were away to Country Bowls. Final score shots 91 – 87. Points 8 – 4. Best winning rink, S Sellwood, B Farrington, skip D Thompson. 28 – 10. In the A division the Oaks were at home to San Luis Tigers, final score – shots 97 – 78. Points – 12 – 0. Best winning rink was M Stephens, M Dewar, skip M Kelly. 21 – 14. On Monday in the Discovery Division, the league we want to avoid relegation was not a good result for the Falcons. We were playing away to La Marina Pathfinders and the result was a disaster. Enough said. The final score was 41 shots for Horadada to 101 against giving us once again zero points to 12 against. We have four matches left to play this season, three are at home so come on Falcons we have to win our home games. We know we can do it, we have the players. Jenny Davis, John Bailey and Fred Trigwell 17 -17. The final result was 91 shots for to 68 against giving us a much needed 11 points to 1 against. With reference to the Monday Falcons and the Friday Royals, we have three home matches left to play for the Falcons and two for the Royals. You cannot get a better advantage than that to finish the season so let’s go for it Team Horadada. Keep ‘em bowls a rollin’ Guys. La Marina Bowls Club with Chris Bould. Monday 25- 02-19. The Explorers we’re away to San Miguel Beagles. The spoils were all equal, 6 points each, the shots were 66 to 69. Best winning rink, Maureen Kidd, Phil Pape and Don Fowkes 17 – 5. Wednesday 27-02-19. Winter leaguers we’re away to San Luis. They had a bad day at the green, losing 0 – 12. Shots were 51 – 128. Better luck next week. Friday 01- 03 – 19. The Ospreys we’re away to San Luis Lions. Better result this time, points for 4 and against 8. Shots were 79 for and 90 against. Best winning rink was Janet Parsons, Jean and Don Fowkes. The weekend of March 9th is the finals of our inter club competitions. Please come along and add your support to the competitors. Check out the noticeboards for schedules.